Objectives: The effect of administration of nifedipine on vascular compliance of the radial artery in patients undergoing coronary intervention was evaluated. Methods: A total of 60 patients was administrated of nifedipine one day pre-operation. The diameter, resistance index (RI), and systole peak velocity (SPV) of the radial artery were measured by Ultrasound-Doppler. Results: The greatest effect on RA diameter, SPV and RI was observed 5 minutes after administration of nifedipine. For baseline diameters <2.73 mm, RA diameter increased signiÃ¯Â¬Âcantly compared with the baseline after 5 and 15 minutes (2.72 ± 0.19 mm vs. 2.38 ± 0.13 mm, P<0.001 and 2.69 ± 0.17 mm vs. 2.38 ± 0.13 mm, P<0.001, respectively), whereas the diameter was unchanged compared with the baseline after 30 minutes. Conclusion: it was determined that administration of nifedipine before TRI improved function of the radial artery. The radial artery (RA) is usually selected as the principal approach for coronary intervention, but its small diameter increases the difficulty of vessel puncture. It has been found that the use of sedative drugs prior to radial artery puncture improves the success rate of puncture and reduces the incidence of spasm. Interventional cardiologists inject nitroglycerin or diltiazole after radial artery puncture in the majority of interventional heart centers. Because the diameter of the lumen of the radial artery often becomes reduced either before or during the process of puncture it has become an obstacle to the use of the radial artery as an approach [2,3]. Therefore, it is necessary to use drugs to increase vascular compliance before puncture. Nifedipine strongly blocks the internal flow of calcium ions leading to the relaxation of vascular smooth muscles and a reduction in vascular resistance. Further research is required to ascertain whether the preoperative administration of nifedipine alters vascular compliance. We included 60 consecutive patients in the study which was administrated of nifedipine one day prior to surgery. The study population consisted of all the patients who underwent coronary angiography (CAG) or percutaneous coronary intervention (PCI) at the First Hospital of Qinhuangdao from January to June 2017. Patients in the nifedipine group received a 10 mg dose (Shijiazhuang Pharmaceutical Group, Shijiazhuang, China), whereas patients in the control group did not receive a dose of the drug. The inclusion criteria of patients into the study were those who were admitted for coronary intervention for the first time. The exclusion criteria were those with a previous history of transradial coronary intervention (TRI), a negative Allen test, peripheral vascular disease, ST-segment elevation myocardial infarction (STEMI), non-ST-segment-elevation myocardial infarction (NSTEMI), left ventricular ejection fraction <40%, New York Heart Association class III or IV, treatment with calcium antagonist and refusal to participate in the study. The study protocol was approved by the ethics committee of the First Hospital of Qinhuangda. The study was conducted in accordance with the Declaration of Helsinki. An experienced vascular sonographer who was blinded to the patients’ allocation measured the diameter, resistance index (RI) and systole peak velocity (SPV) of the RA after 5, 15 and 30 minutes using ultrasound (Philips iE-elite, Netherlands with a 5.0 to 12.0 MHz linear transducer). Baseline heart rate and blood pressure were recorded. RA function was determined at a landmark 3 cm from the radius styloid process. Baseline studies were performed in an air-conditioned room at constant temperature. All calculations were analyzed with the SPSS statistical software (version 17.0, SPSS Inc., Chicago, IL). The continuous variables were expressed as means ± standard deviation for normally distributed variables while as median with interquartile range for non-normally distributed variables. The categorical variables were presented as percentages. Continuous variables were compared using the Student t test for normally distributed value and the Mann-Whitney U test for non-normally distributed. Proportions were compared using the Chi-square test or Fisher exact test if the expected frequency was<5. P<0.05 was considered statistically significant. The characteristics of the study population are summarized in (Table 1). There was no difference in mean arterial pressure and heart rate at the different study time points (Table 2). Results are mean ± SD or n (%). LDL, low-density lipoprotein; CAD, coronary artery disease. Patients were aged 57.4 ± 5.5 years, 63.3% being male. Mean arterial pressure (MAP) after 5, 15 and 30 minutes was 90 ± 13 mmHg, 89 ± 15 mmHg and 93 ± 16 mmHg, respectively, unchanged compared with baseline (92 ± 12 mmHg). Heart rate at the same time points was 74 ± 16, 72 ± 18 and 71 ± 16 beats/min, respectively, also unchanged compared with baseline (73 ± 15 beats/min). After 5, 15 and 30 minutes, the mean diameter of the RA was 2.85 ± 0.21 mm, 2.81 ± 0.19 mm and 2.69 ± 0.18 mm, respectively. At the 5 and 15 minute time points, the diameter was signiﬁcantly larger than that of the baseline diameter (2.85 ± 0.21 mm vs. 2.73 ± 0.21 mm, P=0.002 and 2.81 ± 0.19 mm vs. 2.73 ± 0.21 mm, P=0.03, respectively). Conversely, the diameter at 30 minutes was unchanged compared with the baseline. Thus, the effect of nifedipine on the diameter of the RA was greatest at 5 minutes. The dilation effect was related to baseline diameter. For RAs with a baseline diameter ≥2.73 mm, mean RA diameter at baseline, after 5, 15 and 30 minutes was 3.01 ± 0.22 mm, 3.00 ± 0.24 mm, 2.98 ± 0.20 mm and 2.98 ± 0.21 mm, respectively. For diameters <2.73 mm, the diameter increased signiﬁcantly compared with baseline at 5 and 15 minutes (2.72 ± 0.19 mm vs. 2.38 ± 0.13 mm, P<0.001 and 2.69 ± 0.17 mm vs. 2.38 ± 0.13 mm, P<0.001, respectively). Again, the diameter after 30 minutes was unchanged compared with the baseline. Five, 15 and 30 minutes after nifedipine administration the RA SPV was 56.7 ± 7.9 cm/s, 52.1 ± 6.2 cm/s and 49.3 ± 5.8 cm/s, respectively, signiﬁcantly higher than the baseline measurement after 5 and 15 minutes (56.7 ± 7.9 cm/s vs. 48.7 ± 9.4 cm/s, P<0.001 and 52.1 ± 6.2 cm/s vs. 48.7 ± 9.4 cm/s, P=0.02, respectively). The SPV after 30 minutes was unchanged compared with the baseline. Thus, nifedipine induced the greatest effect on RA SPV after 5 minutes. RA RI was 0.77 ± 0.09, 0.81 ± 0.04 and 0.83 ± 0.05 after 5, 15 and 30 minutes, respectively. The RI after 5 minutes was signiﬁcantly lower than the baseline RI (0.77 ± 0.09 vs. 0.82 ± 0.06, P<0.001), but unchanged after 15 and 30 minutes compared with the baseline measurement. Thus, the greatest relaxant effect of nifedipine as indicated by RA RI was observed after 5 minutes. A key finding of the present study was that nifedipine was safe and appropriate for application prior to TRI. Change in RA function was related to initial RA baseline diameter. In patients with clinical hypertension and coronary heart disease, nifedipine has the effect of fast, peripheral vasodilatation, although it is not common to administer this short-term calcium ion antagonist. We found that the effect of nifedipine on normal blood pressure and heart rate was smaller, but it decreased systolic pressure that was more than 140 mmHg by 10-20 mmHg within 30 minutes. Hospitalized patients with high blood pressure in our study were mostly controlled with blood pressure medication. Blood pressure was uncontrolled in only 6 cases which may be associated with nervousness during the pre-operation inspection, but the phenomenon of increased heart rate was not observed, which may be related to the use of long-term oral antihypertensive drugs causing the catecholamine activated receptor in the heart to be down-regulated. In addition, for patients with a blood pressure of less than 140/90 mmHg, nifedipine did not reduce their blood pressure so the phenomenon of reflex activation of the heart rate increase did not occur. Unlike diltiazem and verapamil, nifedipine only inhibits the deactivated state of the calcium channel, so time is required to recover after inactivation is prolonged. The frequency dependency is weak, so for cardiac autonomic activity and heart rate, the cardiac conduction system is less affected. There were no observations of angina induced in any patient after the administration of nifedipine, which has little effect on normal blood pressure and heart rate. Because the product of blood pressure and heart rate was constant, cardiac output was also constant. On the other hand, high blood pressure decreased with heart rate not increasing rapidly, thus cardiac output decreased. Additionally, nifedipine strongly expanded the diameter of the coronary artery, so administration of nifedipine before surgery should be regarded as safe and an appropriate intervention. The radial artery is a muscular artery which is rich in smooth muscle cells. The main receptors on vascular smooth muscle cells are alpha-adrenergic receptors and are thus sensitive to catecholamines[5,6]. Through a preliminary study, it was found through optical coherence tomography (OCT), which examines the relationship between the artery diameter and the medial membrane thickness, that the radial artery diameter was directly related to the thickness of the medial membrane. Thus, a thin medial membrane is easier to expand, the radial artery was more compliant when it had a small diameter. In larger diameter radial arteries the compliance was relatively small due to the medial membrane being thicker. 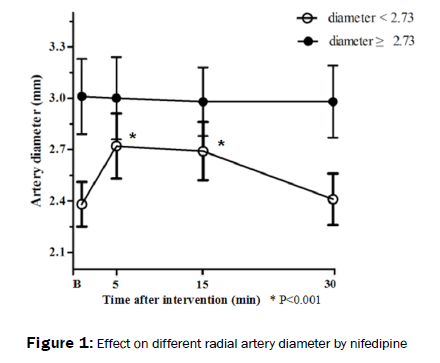 We found that when the radial artery diameter was less than 2.73 mm, its expansion due to the effects of nifedipine may be related to medial membrane thickness. This study found that for the RI value of the RA to be clearly decreased after administration of nifedipine, and SPV increased, the RA diameter has to be greater so that blood flow is higher, since cross sectional area of an artery is related to blood flow=arterial pressure/RI. Thus, in the case of constant radial pressure, blood flow is determined by blood flow velocity and is inversely proportional to vascular RI. Accelerated blood flow in the RA caused an increase in the surface shear force of the vascular endothelial cells which triggered the cell membrane to produce nitric oxide (NO). This caused vasodilation as the relaxation factor diffused through the intercellular space into the vascular smooth muscle cells causing a decrease in intracellular calcium ion concentration and vascular smooth muscle relaxation. Nifedipine acted on the vascular smooth muscle, blocking calcium ion flow in order to reduce peripheral resistance, increasing blood flow velocity and strengthening the positive feedback effect of vascular endothelial cells[7,8]. RA endothelial cell injury following TRI has been examined by OCT, and the researchers found that the diameter of the RA was the most important factor affecting the injury. Another study found that the smaller the diameter of the RA, the more likely it was to suffer spasm. Therefore, it is possible to alleviate the endothelial injury caused by the RA puncture by improving the conformance of the RA through nifedipine. This clinical trial only studied the effects of nifedipine and the optimal time for the RA in a preoperative patient. The incidence of RA spasm was not compared in these 60 patients, although they did not have radial artery spasm during calm rest (figure 1). In conclusion, administration of nifedipine before TRI improves the function of the radial artery. Deftereos S, Giannopoulos G, Raisakis K, et al. Moderate procedural sedation and opioid analgesia during transradial coronary interventions to prevent spasm: a prospective randomized study. JACC Cardiovasc Interv.2013;6:267-273. Varenne O, Jegou A, Cohen R, et al. Prevention of arterial spasm during percutaneous coronary interventions through radial artery: the SPASM study. Catheter Cardiovasc Interv. 2006;68: 231-235. Kwok CS, Rashid M, Fraser D, Nolan J, Mamas M. Intra-arterial vasodilators to prevent radial artery spasm: a systematic review and pooled analysis of clinical studies. Cardiovasc Revasc Med. 2015;16:484-490. Schulte KL, Laber E, Braun J, Meyer SW, Distler A, et al. Nifedipine vasodilates human forearm arteries and dorsal hand veins constricted by specific alpha-adrenoceptor stimulation. Gen Pharmacol. 1987;18:525~529. He GW, Yang Q, Yang CQ. Smooth muscle and endothelial function of arterial grafts for coronary artery bypass surgery. Clin Exp Pharmacol Physiol. 2002;29:717-720. He GW. Arterial grafts for coronary surgery: vasospasm and patency rate. J Thorac Cardiovasc Surg. 2001;121:431-433. Ross R, Glomset JA. Atherosclerosis and the arterial smooth muscle cell: Proliferation of smooth muscle is a key event in the genesis of the lesions of atherosclerosis. Science.1973;180: 1332-1339. Furchgott RF, Zawadzki JV. The obligatory role of endothelial cells in the relaxation of arterial smooth muscle by acetylcholine. Nature.1980; 288:373~376. Yonetsu T, Kakuta T, Lee T, Takayama K, Kakita K, et al. Assessment of acute injuries and chronic intimal thickening of the radial artery after transradial coronary intervention by optical coherence tomography. Eur Heart J, 2010:31:1608-1615. Fukuda N, Iwahara S, Harada A, Yokoyama S, Akutsu K, et al. Vasospasms of the radial artery after the transradial approach for coronary angiography and angioplasty. Jpn Heart J. 2004;45: 723-731.